Peterson asked Moniz to comment on the relationship between the national debt and our ability to make strategic federal investments in the future. Moniz said that rising interest costs could aﬀect our path forward by crowding out investments that will help facilitate a shift from a “natural resource–based energy system, to a technology-based system” relying on sources like energy and wind. Moving on to the topic of nuclear modernization, Peterson noted that the Congressional Budget Office has estimated a cost of $1.2 trillion over 30 years to modernize our nuclear facilities and delivery systems. Moniz differentiated between the work that needed to be done at aging nuclear facilities to ensure safety and investments in updating and modernizing the delivery systems that make up the nuclear triad. Although both are important, he said, the facilities, improvement is only about 10 percent of the cost and is the most urgent issue. The remaining 90 percent is also vital to maintaining our global strength, but “that’s where the policy discussion can come in, in terms of potentially ameliorating some of those costs,” he said. 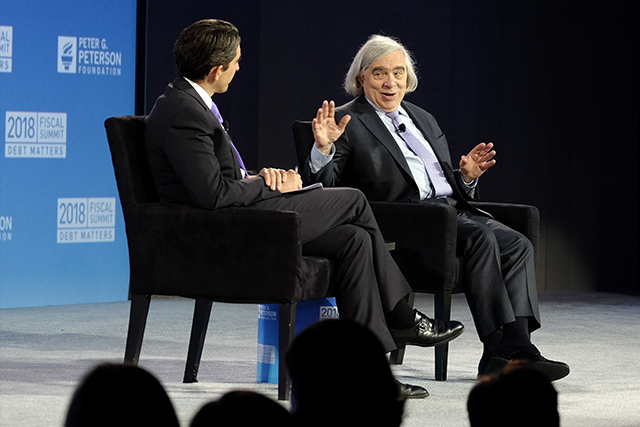 Tying these issues together, Moniz cited cyber security as a “threat across the economy” that reaches to the energy sector and command and control of our nuclear weapons. Speaking of his work leading the Nuclear Threat Initiative, Moniz emphasized the critical need to restore a viable American-Russian dialogue and to maintain vigilance about the spread of nuclear power globally.